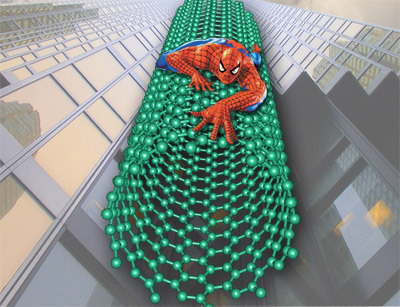 COLUMBIA, 9/21/12 (Beat Byte) -- The carbon nanotube -- a miracle material hailed for its strength, durability, and diversity of uses, from drug delivery to electronics -- is toxic to aquatic life and not safe enough for mass production, say Mizzou engineering researchers. Their findings are a powerful cautionary tale about the promise of nano-technology, a white hot tech field that may cool as scientists consider the environmental and ecological implications of putting nano-scale materials to work. "The great promise of carbon nanotubes must be balanced with caution and preparation," said Baolin Deng, professor and chair of chemical engineering at the University of Missouri. "We don't know enough about their effects on the environment and human health. The EPA and other regulatory groups need more studies like ours to provide information on the safety of CNTs." Slender tubes of carbon atoms in the one-billionth of a meter size range, carbon nanotubes (CNTs) are a great tech hope. To avoid harming healthy tissues, CNTs can deliver highly-targeted doses of chemotherapy to cancerous tumors. With their tensile strength and durability, they can reinforce steel girders and add years to roads and bridges. Unusual electrical and thermal properties have made CNTs promising candidates for a new generation of tiny, ultra-efficient motors that spin without friction and heat loss. But despite their harmless name -- carbon is not a worrisome toxin -- CNTs contain nickel, chromium and other heavy metal impurities that Deng and colleagues at the US Geological Survey found harmful to four aquatic animals, including two common foodstuffs: mussels (Villosa iris), small flies' larvae (Chironomus dilutus), worms (Lumbriculus variegatus) and crustaceans (Hyalella azteca). waste management and handling procedures can minimize this risk. Also, to control long-term risks, we need to understand what happens when these composite materials break down."